I guess it could be said that at 80 years old sax player Charles Lloyd is the current elder statesman of jazz. He has a new album out and he's been touring with his current band The Marvels. I first heard of Lloyd in the 60s when he was experimenting with jazz rock for Atlantic Records. These days his music is straight ahead jazz. He was born Mar. 15, 1938 in Memphis. He was given his first sax at age 9. He listened to Charlie Parker and Coleman Hawkins on the radio. His closest friend was trumpeter Booker Little. And they would usually play gigs together with George Coleman, Harold Mabern, B.B. King and Bobby "Blue" Bland. Lloyd moved to Los Angeles in 1956 to earn a music degree at USC. He played clubs with Ornette Coleman and Don Cherry among others. In 1960 Lloyd replaced Eric Dolphy as music director in Chico Hamilton's band. Then he joined Cannonball Adderley's band in 1964. He started his own band after recording as a leader for Columbia. Then he moved to Atlantic and had a lot of success with the 1966 album Forest Flower: Live At Monterey. Lloyd mixed jazz with psychedelic rock and that got him gigs with rock acts like The Doors and The Byrds. This was before jazz rock became popular which makes Lloyd a pioneer. In the 70s Lloyd recorded occasionally. But mostly he was music director for The Beach Boys. He returned to jazz in 1986 after a serious illness and he signed with ECM Records in 1989. He formed a new band with Swedish pianist Bobo Stenson. Requiem first appeared on the 1992 album Notes From Big Sur. That album is not available. But he recorded the song again on the 1999 album Voice In The Night with John Abercrombie on guitar, Dave Holland on bass and Billy Higgins on drums. That one is available on CD. 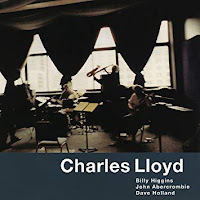 In 2007 Lloyd formed his current band with Jason Moran on piano, Reuben Rogers on bass and Eric Harland on drums. He left ECM for Blue Note in 2015. That band's latest CD Passin' Thru was released in 2017. On his latest album Vanished Gardens, Lloyd adds to his usual band guitarist Bill Frisell, pedal steel guitarist Greg Leisz and singer Lucinda Willams. Charles Lloyd and The Marvels are currently on tour. Lloyd has received several honors but I guess the big one is he was inducted into the Memphis Music Hall Of Fame in 2016. Here's Charles Lloyd with John Abercrombie on guitar, Jeffrey Littleton on bass and Billy Hart on drums performing Requiem in Vienna, Austria 1999.